What do you do in your free time? Well, if you ask the same question to me then my reply would be like, "I spend most of my free time to improve my older blog posts ranking." 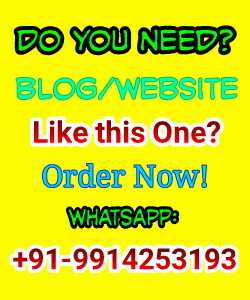 Now you may also want to know the steps which are done by me to rank my older blog posts in search engine result pages. Today in this post I will teach you about three amazing tips which will definitely help you to boost the ranking of your older posts in SERP's. Mostly, we bloggers don't give attention on the older posts and always be busy in creating new posts. But trust me guys, If we make some significant changes in older posts, then again they will be ranked in search engines. Usually, search engines also give priority to rank newer posts instead of older posts. But the steps which I am going to reveal in this post is working and I use these steps on the daily basis in my blogging career to improving the rank of my blog Tips2secure. If you are in blogging career then you might know the value of Interlinking the posts. Interlinking your own posts help in SEO of your blog. Well, here I will not talk on interlinking about detail. You should link the Url of older posts in your newer posts. It will send some significant traffic to your older posts, which send pings to search engines that users are still taking interest in your older posts and there will be a chance to get rank for older posts again in search engines. Updating older posts is very necessary and a key part of successful bloggers. Sometimes, we see that we are getting some traffic from older posts so it's our duty to keep updating that post with the latest information to satisfy our readers. If we don't update then users will start ignoring our posts and it will be the reason of high bounce rate and Pogo sticking. If this thing will happen lots of time then our site might be penalized by google and you will lose all your rankings and reputation. So keep in mind that updating posts are very important. Now I will talk on the ways and techniques of updating posts. If you are a Wordpress blogger then there are some plugins and pre-designed templates which help you in updating your posts. They also update the date and time of the last update of a post. But unfortunately for the bloggers who use Blogger.com as their blogging platform have no access to this automatically. But still they can update their posts in two ways. I am also hosting Tips2secure on blogger and use these two ways in updating older posts. 1) Update post by adding additional knowledge and information in your post and mention the date and time of the last update of a post. Then after use a tool from Google webmasters 'Fetch as Google' to crawl the updated Url almost instantly by Google and search engine crawlers. 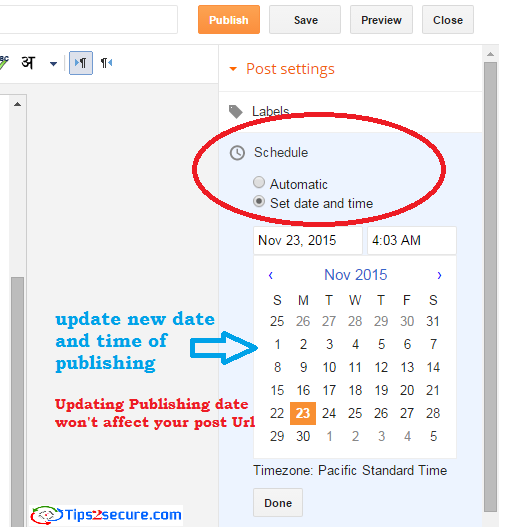 2) Update date and time of your published posts. You can do this by using 'Schedule' option provided by Blogger. To update your post, Edit your older post and click on Schedule>>Set date and time, update the post with new date and click on Done and finally click on Update. You have done. Using Fetch as google is recommended here also. Sharing older post sends decent traffic on that post and increase the social engagement, which is good for SEO rank. Search engines also keep in mind social engagements and interests while ranking a post in SERP's. If you want to rank your older blog posts then you must follow the above-given steps to get success in your targets. If you have also some ideas which may help to rank older posts then please share with us, it would be appreciable. Really great tips thank you. Please visit my blog and give me some advise by email. Hello, you can ask your questions and blog related queries here: Ask Your Questions and our experts will analyse your issue and provide solutions. Sharing old posts, on social media networks is a great way for ranking old post in SERP. Thanks for sharing some other tips. Yes, you are right. Sharing old posts on Social sites send positive signals to search engines to give some rank in SERP's.